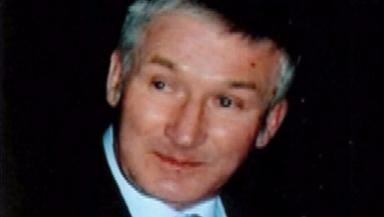 Steven Sidebottom gave his partner a laptop days after the death of Brian McKandie. A murder accused bought expensive gifts for his girlfriend a week after a man was allegedly murdered and robbed at his rural cottage, a trial has heard. Brian McKandie was found dead at the house in Aberdeenshire, in April 2016. Steven Sidebottom was later arrested and charged with murdering the 67-year-old mechanic at the cottage in Badenscoth, near Rothienorman. On Wednesday, Sidebottom's former girlfriend Kudzaishe Chiriseri told the trial at the High Court in Aberdeen that she celebrated her birthday just over a week after the alleged killing. She told the court how Sidebottom had turned up at her flat in Aberdeen at one point with a "wad" of cash that she believed was "thousands" of pounds, a sum she was "shocked" by. The court was told of text messages exchanged between the pair, including some sent three days before the murder referring to a "job" Sidebottom was going to do to recover money he was owed. One read: "I'm not going to bed now, I'm going to do that job with Graeme. If I make it out OK I'll text you when I get home." He later texted again saying the "job" hadn't gone ahead. Ms Chiriseri said she had been concerned because the message "sounded like it wasn't going to be safe". The court heard that on March 19, Ms Chiriseri's birthday, Sidebottom had given her a new laptop and an iPad. Answering a question from advocate depute Iain McSporran QC, Ms Chiriseri said she did not ask Sidebottom where the money for the gifts had come from. Around that time police had announced they were treating Mr McKandie's death as murder and appealed for information around his death. Ms Chiriseri told the trial Sidebottom was "freaking out" about the announcement. In another text message he wrote: "I can guarantee I'm going to be questioned. I was up there all the time. F**k."
Another added: "My fingerprints will be there." Sidebottom, 25, of Rothienorman, Aberdeenshire, denies a single charge of murder by striking Mr McKandie with an unidentified implement or implements on March 11 2016. He has lodged special defences of alibi and incrimination.